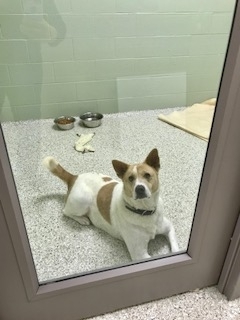 WINNIE SAYS: THE NEW SHELTER IS OPEN!!! A big PAWS-UP and thank you to all who have been visiting our NEW shelter and making donations and bringing all the much needed supplies! We depend on your support in order to care for the animals and we appreciate each and every donation. PINS for PAWS - April 13th - If you like to Bowl and want to help out the SPCA animals....This years ever popular Bowl-a-PAW-Looza will be held on Saturday, April 13th. Check-in time is 5:30pm and bowling starts at 6:00pm at the Bowl-M-Over Lanes in Wellsville. This is a family friendly event - Mixed teams, Adults & Kids...Play 3 games with a 5 Person Team - only $75 per team. To sign up, either fill out the BOWLING REGISTRATION FORM here or the forms are available at Bowl-M-Over Lanes or the at the Shelter. For more information just call the shelter at 585-593-2200 or contact us via Facebook and or email us at spcaallegany@gmail.com. 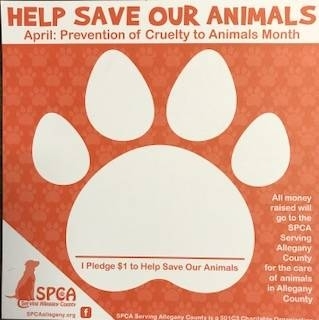 APRIL is Prevention of Cruelty to Animals Month The SPCA is selling PAW-PRINTS not only at our shelter in Belmont but throughout the county at various businesses, stores, banks and restaurants. You can help our cats, dogs and our farm animals that are in our care by donating just $1 until the end of April!! It's so easy to help out and show your support to help us fight cruelty and save animals in need by pledging a $1.00 donation. NEW SHELTER NEWS: "GIVE ME SHELTER"
Our new shelter is FINALLY done and we have moved all the animals to our new shelter!! We are happy to report that we have opened our doors on February 23rd. This has been all made possible by our donors, bequests and several grants. The construction of our Low Income Spay/Neuter clinic was made possible by the ASPCA's NY State Animal Population Control Program grant. We received $100,000 in 2015 to start the clinic and in 2017 we have been approved for another $204,932 to complete the interior construction of the clinic along with outfitting the clinic with the surgical equipment needed. The Spay/Neuter clinic is critical in helping to control the animal population in Allegany County. We also received another grant from the Pedigree Foundation for $10,000 from their Program Development Grants for our indoor Dog Exercise Arena. These funds are being used to help to complete the indoor Dog Arena. The goal is to reduce the stress on our dogs by giving them the opportunity to have some out of the kennel time for exercise and play-time in the arena...thus helping them become more adoptable. A special THANK YOU to the ASPCA, Pedigree Foundation, Bertha Hamilton Foundation & Newman's Own....and let's not forget all of our donors who have made this vision and dream possible. Our NEW home is located at 5440 State Route 19 in Belmont, NY 14813.